Hellblade: Senua’s Sacrifice has been lauded for mind-bending cinematics and top-notch voice acting, but it’s worth remembering one fight in particular that shows the game operating at the peak of its potential. Ninja Theory’s third-person action game can be frustrating. In some moments that works, but there were plenty of times I got snagged on a piece of the environment, held up by an esoteric puzzle, or mauled to death by twig ghosts and wanted to quit the game all together. My love-hate relationship to Hellblade persisted up through the very end, and to this day I’m still not sure how I feel about the game overall. There’s no question in my mind though that the late fight against the zombie wolf Fenrir is its high water mark. Difficulty in games is (no pun intended) a hard thing to get right. As developers revealed in a Twitter thread a few weeks back, many designers go to great lengths to tease out that sweet spot between challenging the player and making experiences in a game feel tense and suspenseful and pushing them to the breaking point wherein the spell is broken. While Hellblade’s puzzles can sometimes feel intuitive since they’re based around matching symbols found on doors to their accidental appearance in the surrounding level, they can also end up feeling a bit jenky, with no explicit rules to delineate a clear boundary between success and failure—think The Witness but even more freeform. The game’s combat is straightforward enough, so much so that it’s easy to overlook. You can dodge, block, attack, and counterattack, like the Arkham games or Shadow of Mordor but more zoomed in and without button prompts. However, this same simplicity is what allows a boss fight like the one against Fenrir to be executed so beautifully and take on such thematic significance. Descending through a series of cavernous dungeons, the beast of Norse mythology stalks the player in the darkness, forcing them to carry a torch and stay within the light to survive. By the time you actually face Fenrir head-on, this dichotamy between light and dark factors in more directly. One moment you’ll be swinging your sword at the snarling creature or rolling to the side as it pounces and then the next everything goes pitch black. It’s jarring and unsettling, much like the protagonist Senua’s experience throughout the systematic destruction of her state of mind and culture. Until you realize that the attack patterns haven’t changed. Fenrir is still pouncing, clawing, and stomping, and you’re still dodging, rolling, and slashing. In these moments you can summon Senua’s special power to see through the darkness, but even when its depleted, the first stage of the fight has already taught you how to survive the second. You can hear whether the would-be Odin-killer is going to come at your from the left or right, wait for the attack, and then try to respond. It’s harrowing but not impossible, and most importantly, lets you use the same skills you’ve been employing all game rather than requiring the player to learn an arbitrary set of quick-time-event cues. The fight shapeshifts and feels disorienting, until you realize the rules are the same and you still have the tools at your disposals to prevail. Vulture recently posted a list of the 100 hardest bosses of all time. It’s varied and covers games from a bunch of different genres. Hellblade’s Fenrir isn’t on there for one simple reason: it’s not hard, at least not in the traditional way. The beast isn’t a bullet sponge and it doesn’t deal an incredibly disproportionate amount of damage to the player. Its pattern of attack isn’t even that complex compared to a notorious opponent like Punch-Out! !’s Mike Tyson. More than a few times during the fight, Fenrir reminded me as much of my cat as a giant rotting wolf. It occasionally paws at you without the most malicious of intents and has a tendency to roll over on its side in playful slow motion. 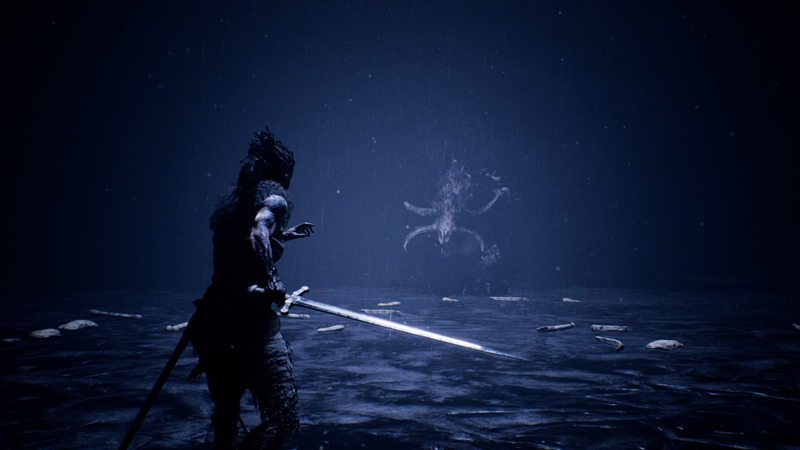 Instead of using sheer brute force to try and terrorize the the player or throw an unintuitive combat puzzle at them, Hellblade simply dresses up the normal combat encounter with a few tweaks and lots of special effects, creating the illusion of a tense struggle without forcing you to beat your head against a wall in order to break through it. The demons that haunt Senua and her psychosis that aids them play out not in a cutscene or audiolog, but in the logic of the game’s familiar combat augmented by the demands of a boss fight. Dying too many times in the game doesn’t actually erase your save data, and despite look down and out a few times during the fight against Fenrir you probably won’t actually get a game over. But you’ll feel like you went through heaven and hell to ultimately defeat Fenrir and avoid seeing one.